Former Cameroon international defender, Benjamin Massing, die dis morning for Edea, im home town, for Sanaga Maritime region for Cameroon. Benjaming Massing wey dey 55 years old, bin play with di national team for Italia 90' World Cup. Tori say na for morning time dem just see say im don die for him bed and e be like say na heart attack. For social media di tori spread and Emmanuel Mabouang Kessak wey play ndamba for 1990 with Massing just halla, "my broda, my combi'. Patrick Mboma, another 'lion' striker for twitter say, 'Lion no dey die, but e dey sleep'. Italia 90' go remain fresh for di mind of Cameroon football lovers and world, as Massing wey be like bulldozer, stop Argentina player Claudio Caniggia, with one hard tackle. Caniggia bin don dribble two players, but when im reach near Massing, di defender put force jam am throway, sotey im boot comot and im get red card. Cameroon bin win Argentina 1-0 for dat first World Cup match. 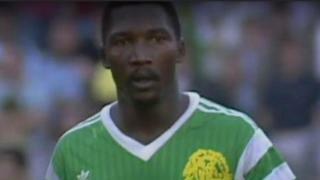 Another player for dat Cameroon 1990 squad, Louis Paul Mfede die for 2013. Massing bin start ndamba for 1980s for Diamant of Yaounde, come go France for Cretail between 1987 and 1991. Massing bin dey play for Olympic of Mvolye when im go play for 1990 World Cup.